For his first lead role in a TV series, James Woods plays Sebastian Stark, a high-powered L.A. criminal defense attorney who has an epiphany when a client acquitted of assault and battery returns to commit murder. After months of self-imposed exile, Stark is lured by the mayor to head the new High Profile Crime Unit of the D.A.’s office. D.A. Jessica Devlin (Jeri Ryan), a onetime student of Stark’s, challenges him to mentor a young staff including idealistic Raina Troy (Sophina Brown), cutthroat Madeleine Poe (Sarah Carter), privileged Casey Woodland (Sam Page), and hard-working Martin Allende (Alexis Cruz). Stark must also make time for his teenage daughter Julie (Danielle Panabaker), who, in the pilot, chooses to live with him rather than move with her mom to New York. Peppered with celebrity cameos, Shark captures the feel of Los Angeles as few series do anymore. Woods delivers Stark’s legal brilliance as well as his personal foibles. Finding screen time for the rest of the cast (particularly Jeri Ryan) was a challenge through the first season, but the show made the splash it needed to be renewed. 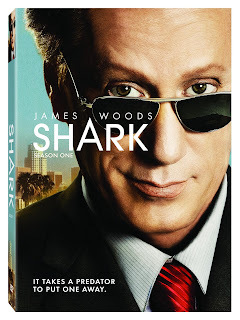 The first season set includes all 22 episodes on 6 discs, two commentaries with James Woods and creator/exec producer Ian Biederman, 19 deleted scenes, a making-of featurette, and a gag reel. For more reviews from Gerald, and the rest of the Crimespree crew, check out the index of reviews.